APASL members are able to access on-line subscription page. To have print copy of Hepatology International, please follow the steps below to renew your　APASL MEMBERSHIP and pay for the subscription to the journal　HEPATOLOGY INTERNATIONAL. Input your information directly to “APASL Membership Application and Subscription Form” on the web. Submit the “APASL Membership Application and Hepatology International Subscription” to us by clicking the submission button. 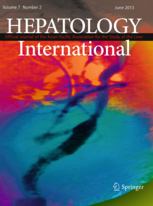 Now the following APASL Guidelines have been published in Hepatology International !! !